Location: The Ibis Hotel in Dave Evan’s Room during the 2017 Dubai Marina Mall Street Performers Festival. Comments: It’s safe to say that some street performers have issues dealing with authority and having others tell them what they can and can’t do. This seems to result in two predictable outcomes. 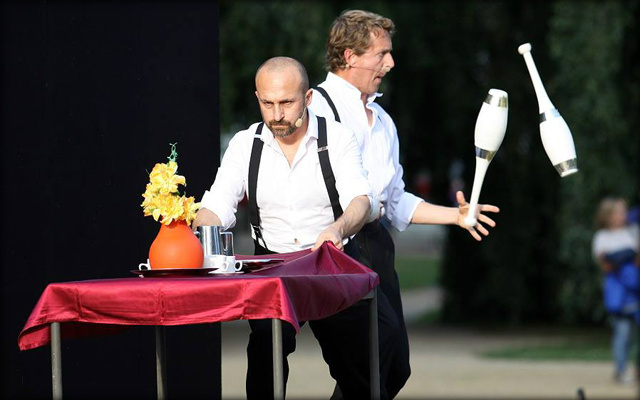 First, finding the world of street theatre provides an alternate reality where they’re able to create their own rules and build their own success. Second, the success they find from resisting conventional paths makes them work even harder to prove to the world that the choices they’ve made are worthy of the praise they get from audiences during each show. 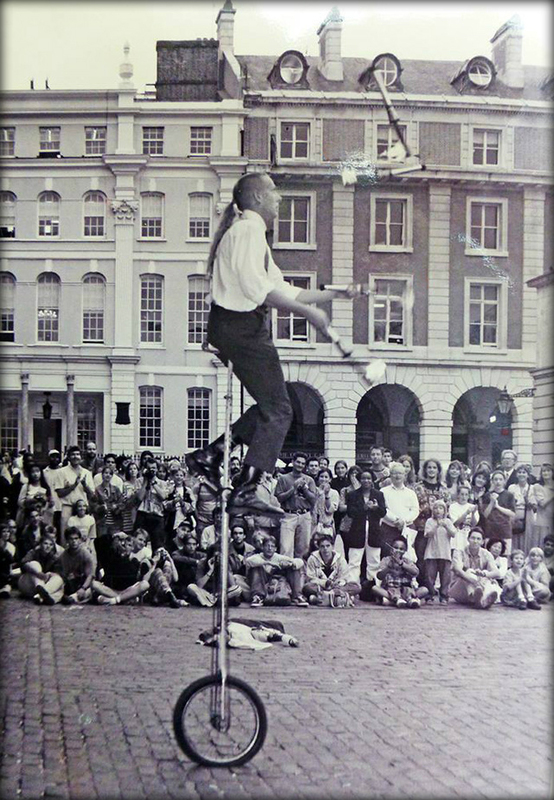 Dave Evans walked away from school at the age of 14 having found juggling and soon there after success as a street performer in Covent Garden. Driven by both a passion for growing his skill set as well as being influenced by all of the performers on the pitch, he quickly established himself as a highly skilled practitioner of the art of street theatre worth of his moniker – The Great Dave! David Aiken caught up with Dave during the 2017 Dubai Marina Mall Street Performer’s Festival to discuss everything from pitch politics in covent garden to working in ensembles to mini tents to how ‘theatrical’ and powerful street theatre can actually be if you’re willing to play to perform and to focus on things other than money. If you haven’t listened to the short story ‘Broken’ which we presented as Episode 88 in which Dave talks about breaking his back during a crazy night of hijinks with Jonathan Taylor from the Daredevil Chicken Club, we’d encourage you to check out that episode first before diving into this one as it’s all very much a part of Dave’s journey. 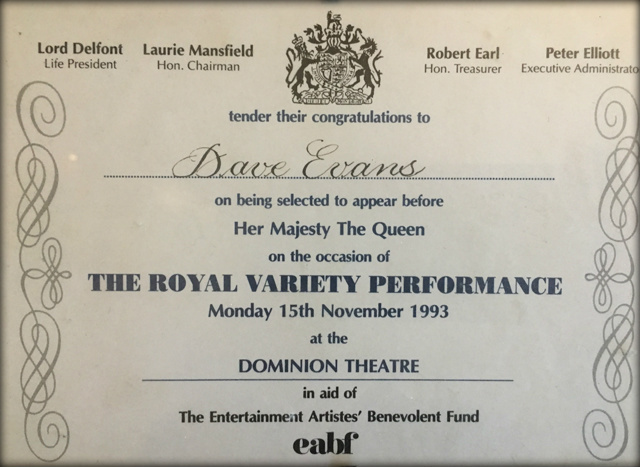 Performing in the Royal Variety Show with Steve Rawlings and Brian Connely in front of the Queen circa 1993. Shared a dressing room with Britain’s variety royalty, had a ball but didn’t get to meet the Queen. Must have done their research on me and not let me anywhere near her! 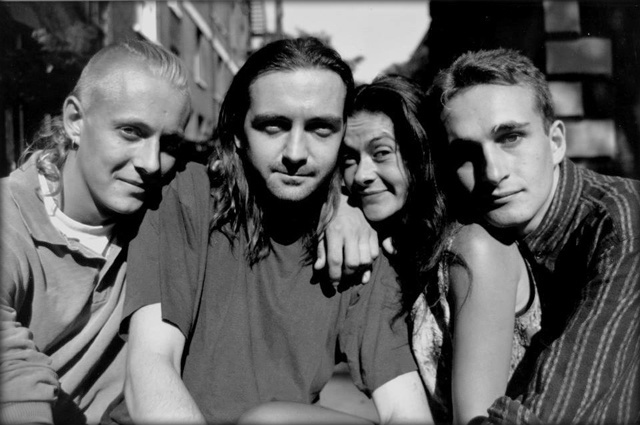 The Three Musketeers, West Piazza circa 1997, from the left Victoria Isaac, Dave Evans, Tom Murphy, Helen Tennison, Herbie Treehead, Humph James and Adrian Davies-Jordan. 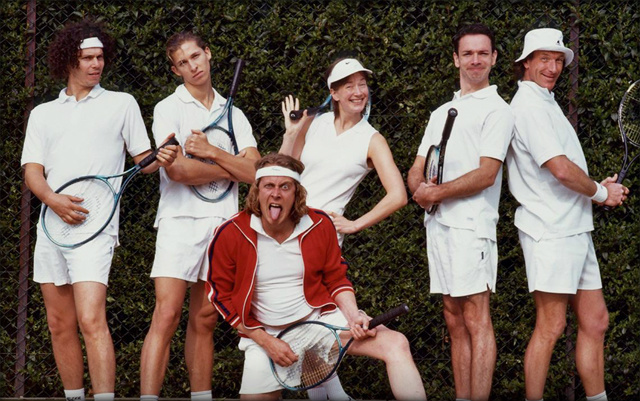 Cast also included Mike Raffone, Ben Langley and Mat Barnard, written and directed by Rob Ballard. 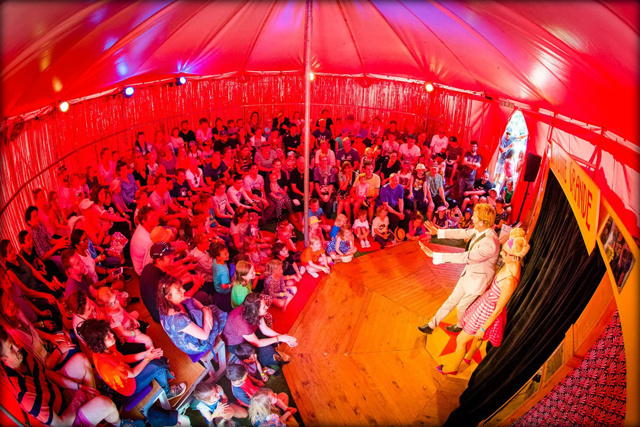 For 4 weeks over the summer we performed to a packed piazza, battling the noise from The Punch and Judy Balcony with no mics! 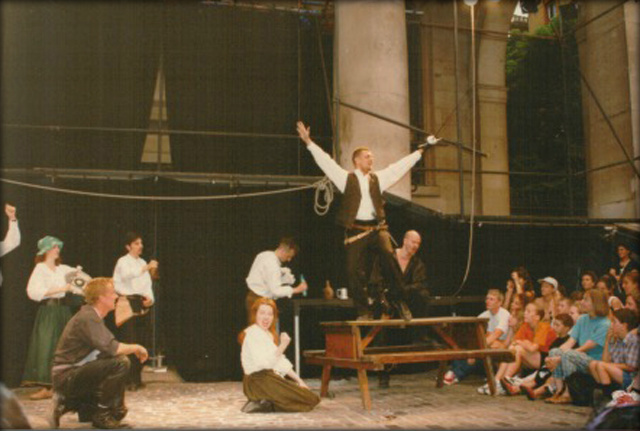 An amazing experience of creating genuine street theatre which lost us all a fortune! The Racketeers with the fabulous Sean Gandini. Anybody that knows Sean will be surprised at this photo but it was an awesome show! Just a bit expensive with a cast of 6! Kept me fit though, basically 12 minutes or sprinting around a tennis court juggling. Photo credit: Andy Barker. Married Men performing at The Klienesfest Im Grossen Garten, Hannover, Germany circa 2015. Whilst recovering from a broken back, Mat and I cobbled together a show to get me back on the streets. Turned into the immensely enjoyable Married Men. We played Klienesfest 4 times and subsequently went on to do 2 years of German Variety Theatres which sent us all mad! Kiki & Pascal. A rare privilege to get to perform with the one you love. And for it to be half good! Kiki, AKA Tamara Campbell keeps me on my toes and makes me laugh hard, a genuine joy to work with. Photo credit: Nina Kourea. 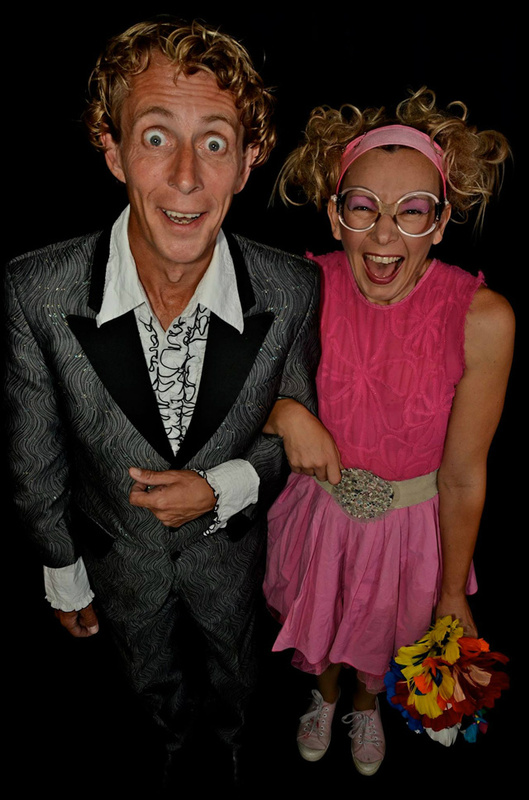 La Petite Grande – Laughter House’s flagship venue if you like! We tried to eliminate all the negative variables that we ever encountered at gigs around the world and create a consistently focussed and electrifying performance space. We are immeasurably proud of what we created and it continues to blow people away wherever it goes! 9 metres in diameter and seats 110 people. The most we ever had in there was 163. Never again! Cafe de Rude – A French themed venue where the staff are just as much a part of there performance as the stage artist. 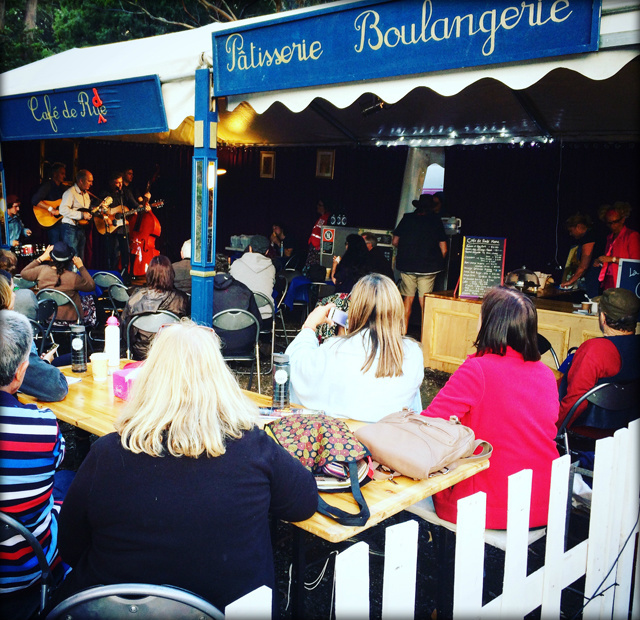 Allowing a more informal performance style, it has taken us to many a music festival hosting stand up, music, cooking demonstrations, karaoke, trivia, bingo… well anything really! 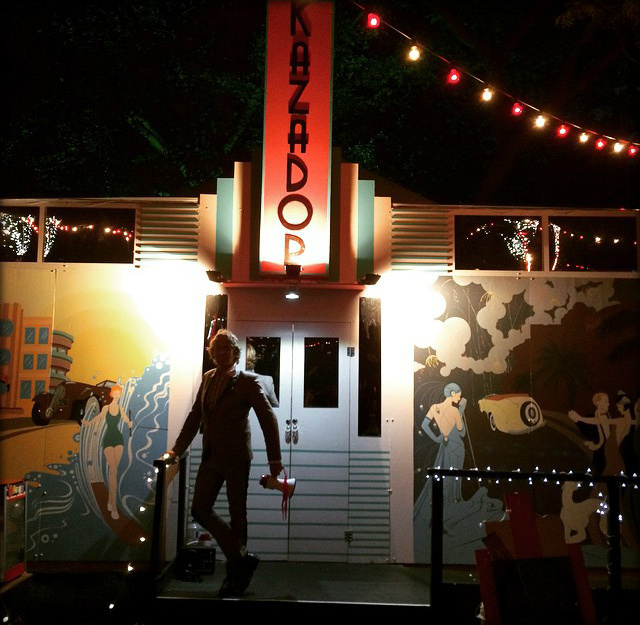 The Kazador – A Miami Art Deco inspired Speigeltent. Originally built for The Assembly Gardens, Edinburgh but now back home in Australia, The Kazador is by far the most beautiful of our 5 venues but a bit of a beast! Weighing in at a hefty 5 tonnes, she takes two days to erect and damn near kills me each time I do it. But it’s worth it – a beautiful thing! 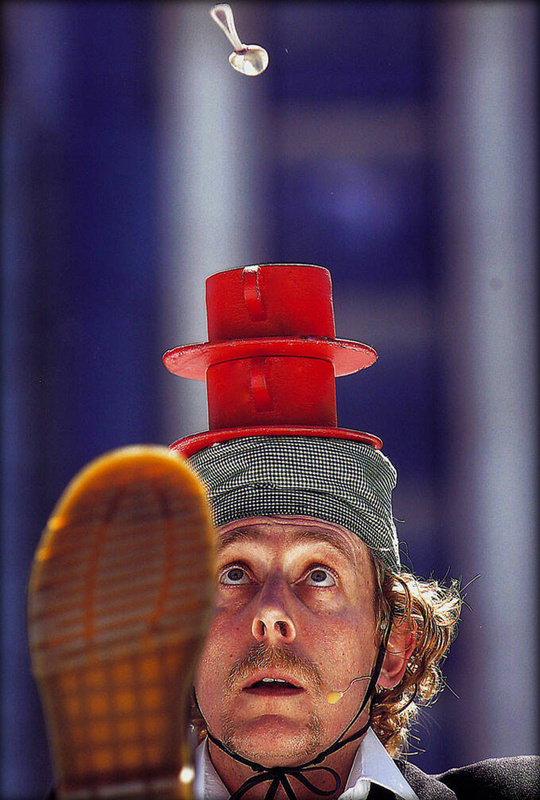 Kicking crockery onto my head at The Christchurch Buskers Festival circa 2004. Inspired by the great Rudy Horn – a trick that I initially learnt on the floor with every intention of then learning it on a unicycle. I then realised that I kicked and rocked with the same foot! In a fit of pique that lasted almost 20 years I discarded it. 20 years later, I decided that once my back had healed that I would revisit this trick. Took me a year to learn but I did it in the end! Hardest thing I ever did.